Will my tree fall? It's a question we frequently hear from concerned homeowners. 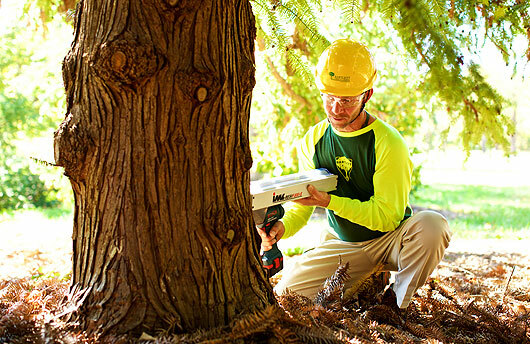 While there are no guarantees with Mother Nature, Bartlett arborists are trained to identify the structural defects that are most likely to result in broken branches or complete tree failure. During a tree structure evaluation, your arborist will look for symptoms of decay, weakly attached branches, cracks, and splits, poor architecture, saturated soils, and root problems. Some of these defects are obvious by visual inspections, but others require a more detailed assessment. For this, state-of-the-art instruments can be used to evaluate the severity of defects. Young trees can have a weak form or structural problems, often the result of a lack of pruning, but as trees age, they become more susceptible to wood decay and other defects. The first priority for arborists caring for older trees is evaluating their structural integrity and providing necessary remedial treatments to reduce the risk of branch, stem, and root failures. If evaluation indicates a tree represents a high risk of failure, remedial treatments can reduce that risk. Treatments could involve pruning to reduce branch weight and wind resistance and installation of structural supports including cables and brace rods that help to limit branch movements during storms. When treatments will not adequately reduce the risk of failure, tree removal should be considered to maintain safety on the property. Managing trees to reduce the likelihood of failures does not begin when a tree grows old; structural pruning of young trees provides a strong framework that will resist stress from storms later in the life of the tree. By providing direction to young trees, many defects can be prevented that require premature removal or more extensive treatment later in the plant's life.